A very simple and nutritious recipe given to me by an Egyptian friend long time ago. According to her, they usually have this to break fast during ramadan. I have modified the recipe slightly adding more vegetables. 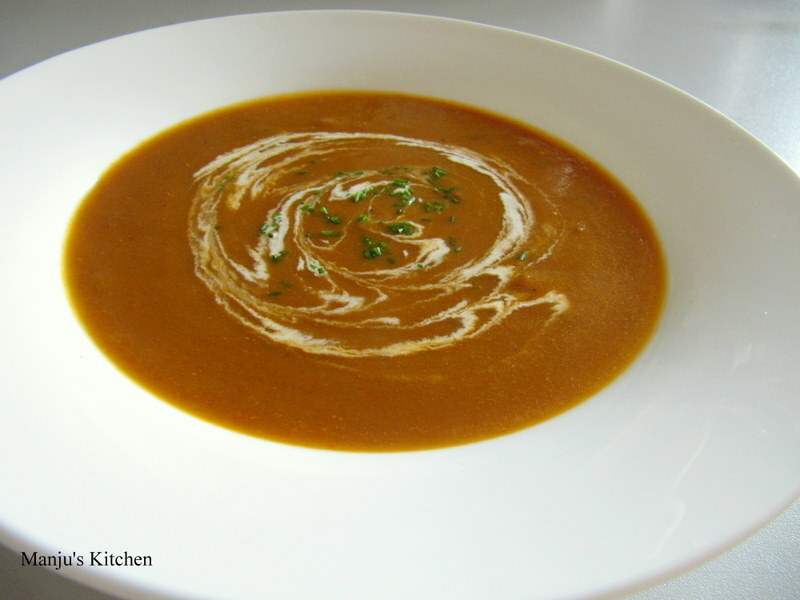 It’s an amazing soup with such simple flavours of red lentils, tomatos and vegetables. I like to make it all the time especially for breakfast. It will keep you going for the whole day. Wash the lentils and cook with the chopped vegetables, cumin powder, chilli powder, stock cube and four cups of water till the vegetables and lentils are starting to breakdown. Leave it to cool down. Blend in a blender or food processor to get a smooth and creamy soup. Pass it through a seive. Re heat the soup (add more water if necessary) and season with enough salt and pepper. Serve warm with fresh cream and chives on top.